Are you looking for the perfect gift for someone special? One of the best gifts that women and men can both appreciate is a bath robe. Bathrobes encompass a variety of styles and designs. They are soft and luxurious. Even the most inexpensive ones still provide a sense of luxury. Since everyone has their own individual preference of what feels “soft” to them, try to find out what kinds of fabric your recipient would prefer. You should also consider the time of year during which he or she will be wearing the robe. Waffle weaved cotton and terry robes are ideal for those who would prefer a lightweight robe. Cashmere is lightweight, but with insulating properties. For a heavy-weight robe, go with Turkish terry cloth or rayon. A few other choices include Egyptian cotton, silk, nylon, plush, satin, and micro fiber. Since bath robes are available in every color imaginable, you have quite a few choices. What about a pastel color such as pale yellow, green, or pink? Or a neutral color such as white, gray, or black? Go for a solid color if you’re buying for a man. For a woman, go with pastel or red. Most bath robes are tied around the waist with a belt or sash. However, button and zipper styles are starting to become popular as well. In cold temperatures, a belted bath robe isn’t the best choice since it leaves the neck and chest exposed. In warm temperatures, a robe with a hood might not be a good idea. If you’re buying for a woman with long hair, a zippered robe might not be a good idea since her hair could get caught in it. You might want to consider having the robe personalized with your recipient’s name or initials. Monogrammed bath robes make great gifts! Also, be sure to choose a high-quality robe so that it won’t tear up easily. 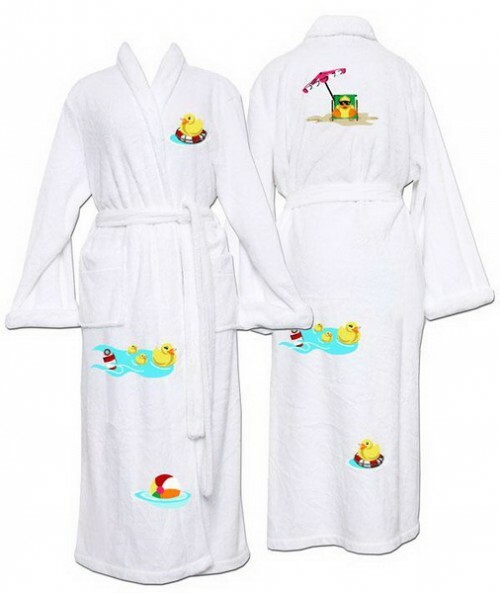 Now you have the information you need for buying bath robes as gifts!